Stacked-NYC: Happy Birthday Grand Central! While I’ve read only a small portion of the many books, articles, and essays that have been written about Grand Central, Maira Kalman’s is one of my favorites. 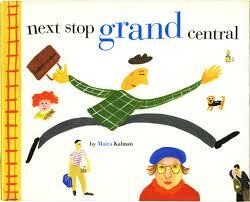 Next Stop Grand Central is a children’s picture book, but I think most adults will enjoy the whimsical text and drawings. I love Grand Central! I always recommend it to sightseers. I must tell you, though... you've committed a NYC faux pas in this post. Fans of guided walking tours will quickly spot it. Any ideas? I also really like Maira Kalman. I was a big fan of Tibor Kalman's work, too. I didn't know anything about Tibor Kalman, but now that I've looked him up, I feel certain I've seen his work. I'm going to see what I can find at the NYPL!